Posted almost 2 years ago by S.A.M. 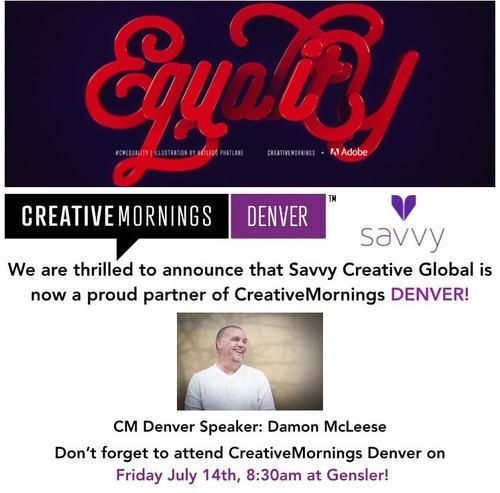 We are incredibly excited to announce that Savvy Creative Global and CreativeMornings/Denver are now official PARTNERS! We couldn’t be more excited to support and collaborate with the members of this innovative global community! CreativeMornings/Denver will be back: FRIDAY JULY 14th at 8:30am at 'Gensler.' The event will feature the inspirational Damon McLeese, Executive Director of 'Access Gallery' / 'VSA Colorado' discussing the theme of EQUALITY and how it impacts his personal and professional endeavours. Damon can be found here on Instagram. It is a lifelong mission for us at Savvy Global to be able to connect with individuals from different backgrounds, communities and expertise. The honor of partnering with @cm_denver allows us to embrace past and future mindsets that have evolved into the world that we call “creative” today. Remember to look out for our awesome Savvy USA team members: Founder & CEO, Juliet O’Halloran and our Associate Director for Denver, Dave Momper at the Creative Mornings event next Friday! See you there, July 14th at 8:30am at Gensler!